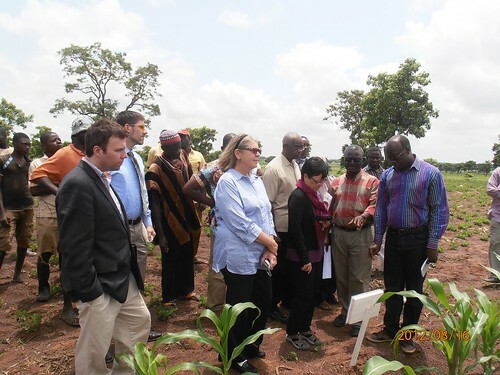 As part of their mission to monitor bilateral and multilateral food security programs in northern Ghana, Janet Stormes, Professional Staff of the US Senate Appropriations Committee, and Dorothy Rayburn of the Bureau of Legislative Affairs, US Department of State, visited the IITA-led ‘Sustainable Intensification of Cereal-based Farming Systems in the Sudano-Sahelian Zone of West Africa’ project on 16 August 2012. They were accompanied by staff of the USAID-Ghana mission and MCC. 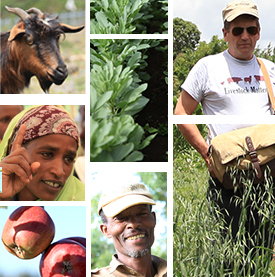 Funded by USAID, the project was launched in January 2012 as one of the three research projects under the Africa Research in Sustainable Intensification for the Next Generation (Africa RISING) program. The project is being implemented in northern Ghana and southern Mali. Africa RISING-Ghana is hosted by the Savanna Agricultural Research Institute (SARI), Nyankpala, Tamale. The team was met by Dr. Asamoah Larbi, Consultant/Farming Systems Agronomist of Africa RISING, and Dr Stephen Nutsugah, Director of SARI. They also held discussions with partners composed of SARI staff and representatives of farmers groups, Ministry of Food and Agriculture (MoFA), Ghana Health Services, University for Development Studies (UDS) and Seed Producers Association of Ghana (SEEDPAG), AfricaRice, ILRI and AVRDC. Dr Larbi briefed the team on the participatory approaches used by the project, value chain research and gender issues. He said that activities are being implemented with partners in northern, upper east, and upper west regions of Ghana. Dr Nutsugah pledged the support of SARI to Africa RISING in Ghana. Zakaria Sumani Iddrisu, president of the northern region branch of SeedPAG, said they are working with Africa RISING to produce quality seeds of maize, cowpea and soybean for distribution to farmers, and train them in seed production. Gladys Gamor reported that UDS is working with the project to train women on processing and integrating soybean and cowpea into diets for improved nutrition. The monitoring team also interacted with about 80 farmers in Kpachi village participating in on-farm demonstration trials of drought and Striga-tolerant maize varieties developed by IITA. This activity is led by MoFA supported by Africa RISING and SARI. Hamida Adam, MoFA Agricultural Extension Agent, explained how MoFA works with farmers in the demonstrations. The team also visited the joint rice seed multiplication and variety trials by SARI and AfricaRice with funding from Africa RISING and the Rice Sector Support Project. Baba Inusa, SARI rice scientist, explained the production of quality rice seed for distribution and identification of adapted varieties for upland and lowland production. The two US Senate staff said that they were extremely satisfied with what they have seen with the project in Ghana. They especially highlighted the involvement of various partners in the implementation of Africa RISING in the country, and look forward to more exciting outputs from the program. Tags: food security, MCC, MoFA, SARI, SEEDPAG, UDS, USAID. Bookmark the permalink.